Climate change will result in hotter and more humid environment for the tropics and mid latitudes resulting in increasing economic costs of reduced work capacity due to heat stress. The study by NOAA scientists said work capacity has already reduced by 10 percent during extreme heat in summer months. This is likely to double to 20 per cent by 2050. One of the physical properties of warmer air is that it can hold more moisture. So in hot weather atmospheric humdity can be more extreme. But there are physiological limits of human health in coping with temperature extremes. In 2010 Scientists outlined health limits of heat stress with Climate Change. The scientific paper by Steven Sherwood from the University of NSW and Professor Matthew Huber from Purdue University - 'An Adaptability Limit to Climate Change Due to Heat Stress' outlined the health adaptation limits of the human body. Humans and most mammals maintain a core body temperature around 37 °C that may vary slightly among individuals but does not adapt to the local climate. To allow transfer and regulation of metabolic heat human skin is strongly regulated at 35 °C or below, a couple of degrees colder than core body temperature. This allows the body to dissipate heat through the skin at wet-bulb temperatures below 35 °C. In this latest study, the researchers looked at military and industrial guidelines already in place for those who work in hot and humid conditions outside, and set those guidelines against climate projections for how hot and humid it's likely to get over the next century, using Wet Bulb temperatures scale which take account of humidity and wind speed. Using a middle of the road modelling projection they estimated that reduced work capacity due to heat stress is likely to double to 20 per cent by 2050. 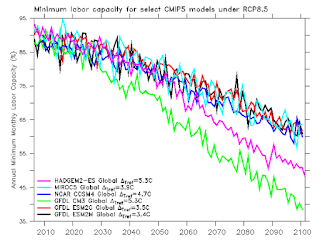 The study modelled the impacts out to 2200 and estimated "labour capacity reduction to less than 40% by 2200 in peak months, with most tropical and mid-latitudes experiencing extreme climatological heat stress." temperature relative to their 1861-1960 reference period. All estimates are bias-corrected to climatological maximum monthly WBGT estimates for 1948-2011 from NCEP, with the decadal maximum month from NCEP added as an anomaly to the decadal climatology. No variance corrections were applied in this case in order to avoid confounding the comparison. Construction workers, agricultural workers, and others who work outside will all be impacted. Some adaptation may be possible with people changing their work patterns to working in the early morning, late afternoon, evenings, at night, or even taking siestas in the hottest part of the day, or changes in clothes to adapt to the hotter more humid environment. "We project that heat stress-related labor capacity losses will double globally by 2050 with a warming climate," said lead author John Dunne of NOAA's Geophysical Fluid Dynamics Laboratory in Princeton. "This effort changes the scope of the climate-change debate by putting the direct human impact in practical terms,” said John Dunne, "It relates to anyone working without the benefit of air conditioning and would be a minimum estimate of heat stress for anyone working in an elevated heat environment, such as a kitchen or furnace." reported Bloomberg. For the more extreme scenarios based upon little mitigation action and business as usual, future global warming temperature rise of 6 degrees C (10.8 degrees F) may be achieved, similar to the scenario warned about by the World Bank Report. The scientists predict it would make it difficult to work outside during the intense heat and humidity of the summer months over large parts of the world at this global temperature rise. "Extreme projections of global warming of 6 degrees eliminates all labor capacity in the hottest months in many areas, including the lower Mississippi Valley, and exposes most of the U.S. east of the Rockies to heat stress beyond anything experienced in the world today," Dunne said in a conference call with the media. Heat stress in cities like New York City would likely exceed that of present-day Bahrain, while Bahrain would literally be off the map with heat and humidity that could cause hyperthermia, even for people at rest. While the US East Coast, midwest and southern states literally fries during summer, the U.S. West Coast and Northern Europe are likely to be less affected immediately by the trend toward more hot and humid climate, said the scientists. "The planet will start experiencing heat stress that’s unlike anything experienced today," Ronald Stouffer, a physical scientist at NOAA’s Geophysical Fluid Dynamics Laboratory in Princeton, New Jersey, and co-author of the report, said on a conference call with reporters according to Bloomberg. "The world is entering a very different environment and the impact on labor will be significant." Dunne outlined that the only way to retain labor capacity is to limit global warming to less than 3 degrees C. Average global temperature has already risen by about 0.7 degree C compared to pre-industrial times and with the huge inertia in the climate system especially contained in ocean warming, we can expect at minimum another 1 degree C by mid- century. But with global carbon emissions still increasing we may very well realize the worst predictions of the World Bank climate report and achieve a rise of 4 degrees C by the 2060s and 6 degrees C by the end of the century. Heat stress will continue to be a major climate hazard which will strike down the ill prepared, the elderly, the very young, those with medical conditions, and the people who can't afford technological adaptation such as air conditioning systems or efficiently insulated houses. If we are successful in drastically reducing carbon dioxide emissions, the risk of heat stress and impact on work capacity will reduce, but it will not eliminate the effect, the researchers found. One of the issues highlighted is the necessity of developing resilience and adaptation to weather extremes, including extreme heat and humidity. An extreme heatwave in Europe in 2003 killed an estimated 70,000 people at least partly because people did not have the resilience to adapt to the extreme heat that was well outside their experience. According to the IPCC 4th assessment "a French parliamentary inquiry concluded that the health impact was ‘unforeseen’, surveillance for heatwave deaths was inadequate, and the limited public-health response was due to a lack of experts, limited strength of public-health agencies, and poor exchange of information between public organisations." A similar heatwave in Andra Pradesh state of India in 2003, where people are more regularly subjected to heat stress by high temperatures and humidity, caused 3000 deaths. The 2010 heatwave in Russia caused 56,000 deaths. So it becomes a matter of how well-adapted certain regions and populations are to extreme heat stress, Dunne said. "It's very regionally dependent and highly determined by adaptation," Dunne said. The study did acknowledge the many uncertainties with regard to the projections including climate sensitivity, climate warming patterns, CO2 emissions, future population distributions, and technological and societal change. Are our public health institutions ready to help communities adapt and survive this hellish world we are creating with global warming? Are our Governments doing enough to reduce greenhouse gas emissions?